A slim box double CD in a slip case with landscape booklet. Year 2015 is marked by the 150th Anniversary of the birth of Jean Sibelius (1865-1957), often titled as "Finland's national composer". The fourth album on Ondine by the Estonian Philharmonic Chamber Choir is dedicated to the complete works for mixed choir by Jean Sibelius. The award-winning choir, one of the finest of its kind internationally, is conducted here by one of the leading Finnish choir directors, Heikki Seppänen who has conducted a large number of professional choirs in Finland and abroad. Jean Sibelius is perhaps best known for his seven symphonies and numerous orchestral works. Yet his extensive output also includes much besides orchestral music. Choral music was a genre in which Sibelius showed an interest throughout his active career and even beyond: he wrote his first choral songs while studying composition in the late 1880s and his last choral setting - an arrangement for children's choir of his favourite Christmas song - at the age of 89 in 1954. 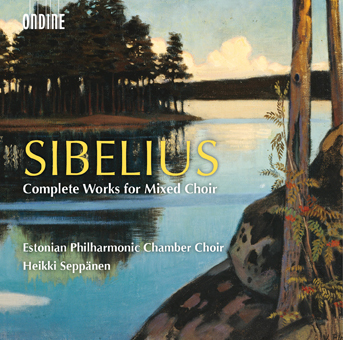 This recording includes Sibelius' complete oeuvre for the Mixed Choir. It includes patriotic works, works closely connected to the Finnish national epic Kalevala, student works, Christmas songs, works based on lyrics by different Finnish poets, works written for school (including Three Songs for American Schools) as well as works written for academic promotions, inauguration ceremonies and different official occasions. It also includes two versions of the famous Finlandia Hymn. The Estonian Philharmonic Chamber Choir's releases on Ondine have been a critical success: the first release was given an ‘Editor's Choice' by the Gramophone Magazine and ‘Disc of the Year' by the renowned German weekly DIE ZEIT.